Frances Meela grew up on a half- acre farm on the slopes of Kilimanjaro. His dad was a subsistence farmer and Frances’ future was likely bound to the family plot. But today in Moshi, the town at the foot of Kilimanjaro, Frances owns three properties, two large houses and a 10 bedroom apartment building that he rents to students. Frances has climbed the mountain physically, socially, and economically. 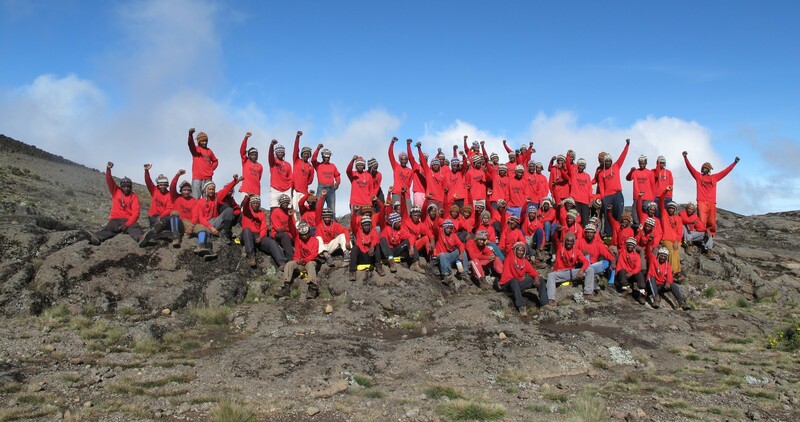 The success of Kilimanjaro’s international tourism has not only impacted the region’s rural villagers, but helped its college graduates. William Macha has a college degree in accounting and was working at a Moshi auditing firm. Among his assignments at that time was doing Tusker’s books. Eddie recognized his talent and today William works in-house at Tusker as its Tanzania operations accountant and office manager. He is making twice his old Moshi auditing salary and his success has lifted his entire family. The family has two cars. His wife uses one to commute to her bank teller job in town. William sends his children to private schools and has built a large, multi-story home for the family. “Working on the mountain allows him to accelerate his chances of success. It offers a better life than working for the government or in town working as a trader. When the tourist season is here the business in Moshi flows. When it’s quiet, business slows,” Julian said. Over William’s four-year Tusker career he has been promoted and today is Julian’s right hand man managing the Tusker office in Moshi. Each year the office manages 1,000 foreign climbers, 13 full time guides, 18 ground staff, 11 vehicles, and up to 2,000 porters. William’s and Frances’ success is a microcosm of the impact Kilimanjaro has had on the daily lives of thousands of Tanzanians. Mount Kilimanjaro has become an economic juggernaut for impoverished Tanzania, producing 13 percent of the nation’s gross national product. With around 35,000 mostly international climbers annually, the mountain has become a job factory employing 10,000 local porters, 500 cooks and 400 guides. World Bank estimates in 2013 show Kilimanjaro tourism throwing off $50 million, of which $13 million was wages for locals. In a country where the average annual income is just $630, those who work on the mountain do far better. Many of the guides and porters are from the Chaaga tribe which has been leading climbs since the late 1800s. Kilimanjaro is a world tourism anomaly in that locals and not international conglomerates benefit the most from tourism. In most parts of the world tourism provides low wage jobs while hotel conglomerates owned by foreigners reap the rewards. Kilimanjaro has the distinction of having the world’s most successful transfer of resources from international tourism directly to the local community, according to a 2009 study by the UK’s Overseas Development Institute. The study found 30 percent of total revenues generated on Kilimanjaro go to locals. The primary reason Kilimanjaro’s dollars don’t flow to European, Asian or U.S. hoteliers is because it is a true adventure travel destination. It is not a soft destination where tourists sit on the beach and spend big bucks in luxury hotels. 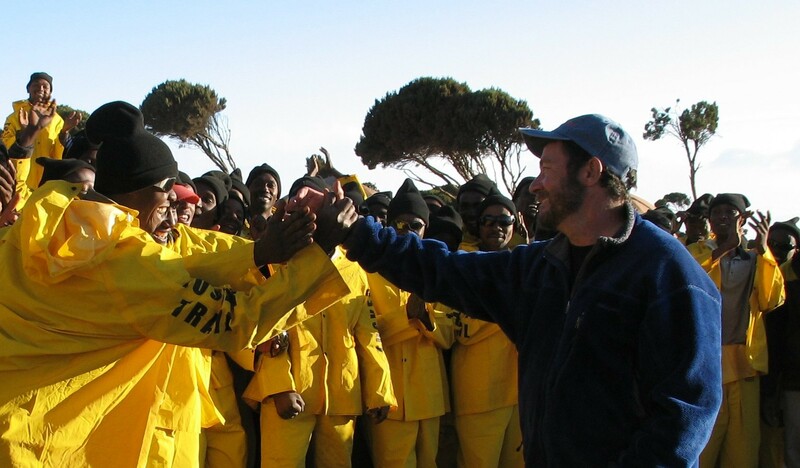 Instead they spend their time and money on the mountain, guided by locals. 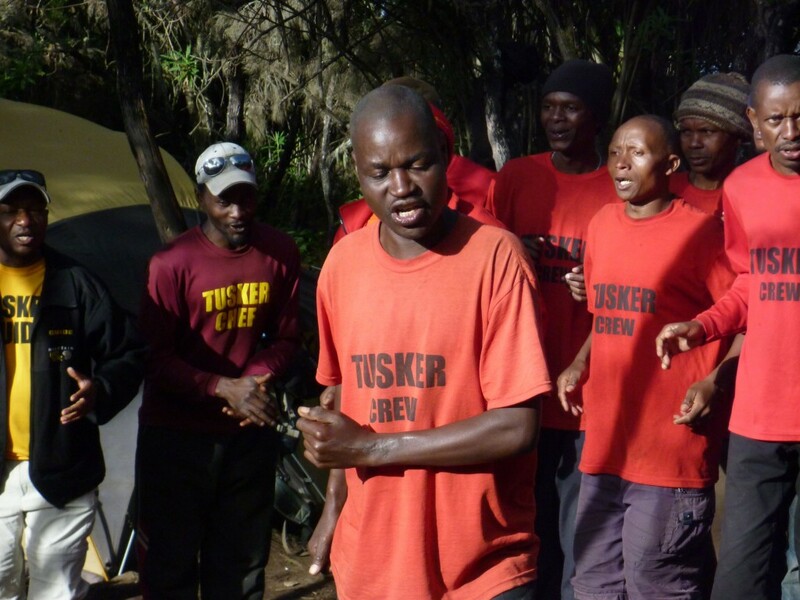 A typical Tusker 10 person climb is supported by three guides, 45 porters and two cooks. 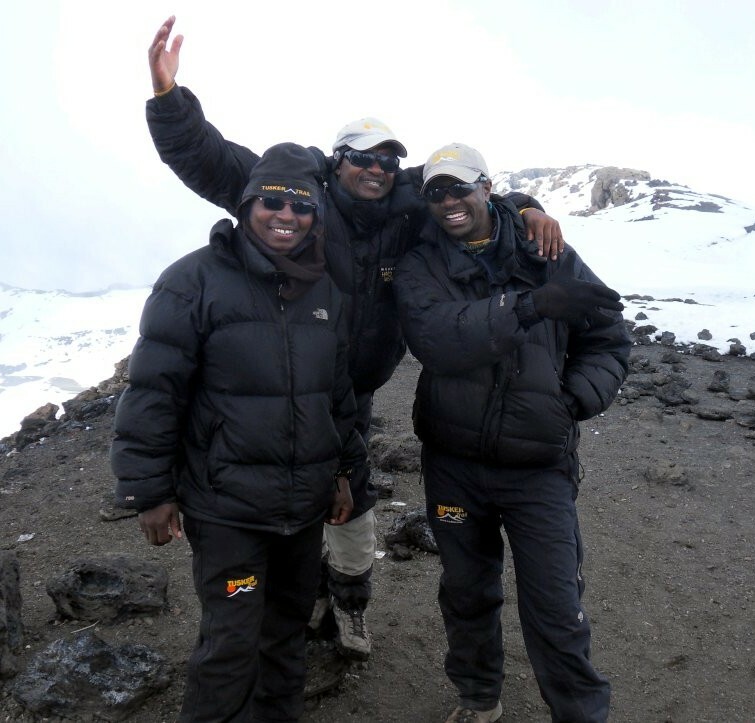 Most Tusker Kilimanjaro travelers spend three nights in hotels; two the night before the climb and the night after descending. The 11,000 locals working on the mountain are not the only beneficiaries of the mountain’s global lure. There are another estimated 30,000 locals who benefit indirectly. Everyone from jewelry makers and wood carvers at the open air stalls to the merchants in the food markets to the farmers who supply them are prospering from tourism. With 90 percent of the food and drink consumed by Kili climbers locally sourced, it’s a boon for the thousands of small farmers working their plots in the fertile plains below the mountain. The Overseas Development Institute report estimates that 50 percent of the handicrafts sold in the markets also go directly to locals. If you’re looking for a good pair of hiking boots or a rain proof jacket, then visit the markets in Moshi where the hand me down boots and clothing given to porters and guides ends up for sale at a tenth of the price you would pay at REI. Eddie is keenly aware of the mountain’s impact on the local economy and says its good business to hire the best, train them, pay them top dollar and retain them. 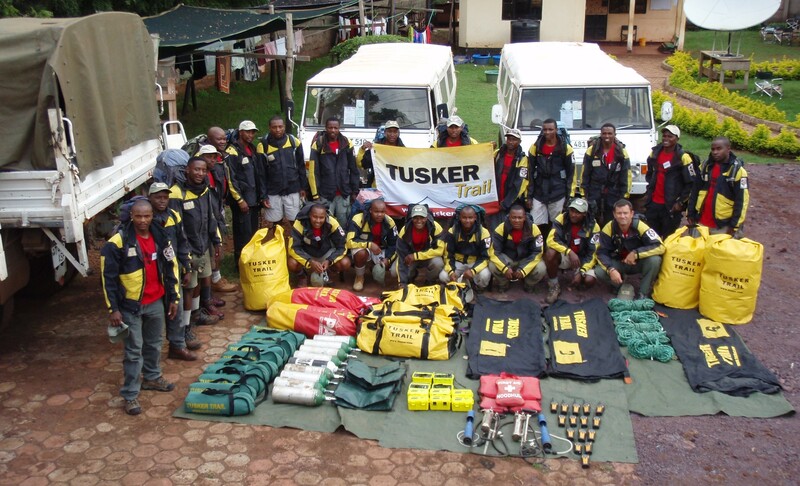 Tusker’s full time staff includes 156 porters, 13 guides, and 18 ground crew who work in the operations base. The payroll includes another 2,000 part time porters. Eddie estimates 60 percent of his Kili trip revenues stay in Tanzania and directly affect over 9,000 people. The average Tanzania family has nearly five children. Eddie has carefully managed compensation issues to keep them in the Tusker fold as well as give Tusker a competitive leg up. It’s not just about wages. Feeding his porters decent meals on the climbs, monitoring their health, housing them in quality tents overnight is a Tusker staple that is not common practice on the mountain by its competitors. Some companies force porters to take meals out of their wages and it’s not uncommon to see porters eating once every two to three days. Porters sleeping in kitchen tents is also a common sight on the mountain. Tusker pays the medical bills when their porters get sick. This is not to say that Tusker has not had issues with staff. Several years ago it was not uncommon for some overly ambitious Tusker guides and porters to hit clients up for money to go to college. Two of his clients had a vulnerable soft spot and financed their educations, but it backfired. To insure equitable pay for his mountain and office staff, Eddie has Julian collect all tips. Julian disperses the money the day after a trip is completed with tips divvied up to all members of the team including the ground staff. Seniority is often rewarded and this system prevents guides from pocketing all the tips, which is a common occurrence among other companies. Tusker has not had a defection and Eddie’s system is working both for Tusker and the local economy. 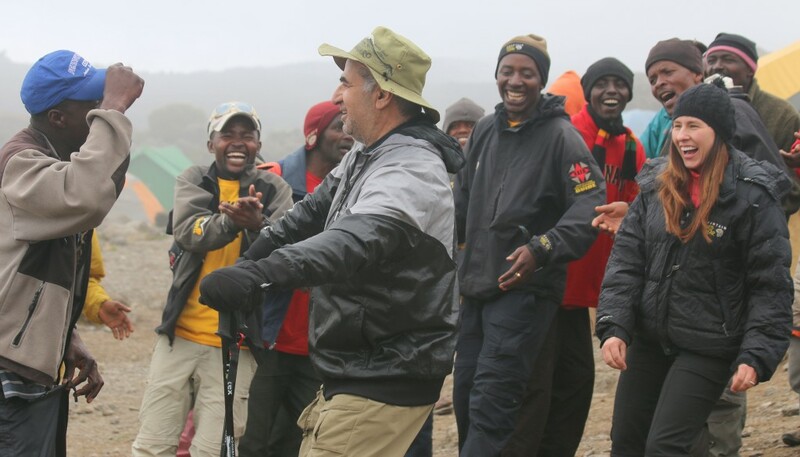 The economy and the well-being of its citizens will continue to improve as long as innovative companies such as Tusker Trail attract an increasing number of climbing clientele. For Frances and William, the benefits of Kili’s success have been realized and will be passed down to their children and future generations.